This is a set of three (3) filter cartridges of the following: KDF85-2510. 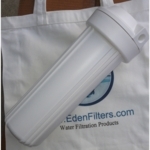 This filter cartridge is 2.5 inch in diameter and 9.875 inch in length and it fits in all standard 10� housing. It has low pressure drop. Flow throughout this UDF cartridge is coaxial from bottom to top. The cartridge has a combination of two media: 9 oz of coconut shell Granular Activated Carbon (GAC) media, together with 1.0 pound (16 oz) of KDF85 media. The total weight of the filled cartridge is 1 lb 9 oz. GAC will reduce chlorine, unpleasant taste and odor and organic matter from water. KDF85 is 85% copper and 15% Zinc. KDF media is effective in removal of lead, pesticides, rust, hydrogen sulfide, iron, nickel, chromium, cadmium, calcium, aluminum, mercury, and arsenic. KDF is bacteriostatic and it is known to control bacteria growth and kill algae and fungi. Normally, the cartridge is installed after a sediment filter cartridge. This cartridge should be installed with the gasket end against the screw cap. Monitoring chlorine residual in treated water is the best way to know when the media was exhausted. When chlorine is detected in filtered water, the cartridge can be replaced. CAPACITY: Flow rate: 1 gpm; Life: 10,000 gallons (estimate).